A massive amount of €154,954,249 was paid out by Microgaming’s progressive jackpot network during last year to a total of nine lucky players who managed to win seven-figure amounts from Microgaming’s progressive jackpot games, corresponding to over €40 million in winnings. The largest jackpot win of €18,915,872.81 was paid out on Friday, 28th September 2018 at Grand Mondial Casino through Microgaming’s Mega Moolah progressive when a player set a new payout record for the progressive online slot from his mobile device. The player’s win surpassed the amount of €17,879,645.12 that netted Microgaming the Guinness World Records title for the “Largest jackpot payout in an online slot machine game” in 2015. On 14th January 2018 a lucky player won €2,424,117.20 wagering at Zodiac Casino while the second mega win of this year was awarded to a player at Royal Vegas Casino when he won an amount of €4,769,344.11 on 27th February. Yet another multi-millionaire was created by the progressive network on 8th March when a massive €4,365,843.63 was won on Captain Cook’s Casino from a mobile device. Thereafter, a lucky player won €4,603,056.85 on Grand Mondial Casino on Thursday, 19th April and €4,931,205.46 was won on Jackpot City Casino on 24th June 2018. On 2nd February Microgaming’s Major Millions 5 Reel slot game paid out €1,896,616.91 to a player at Betsafe Casino while an amount of £1,515,371.53 was won by a player at RedKings Casino on 22nd August 2018. Meanwhile, Microgaming’s progressive jackpot network is showing no signs of slowing down this year with a lucky player at 32Red Casino winning a massive €1,162,021.24 on 2nd January 2019 wagering on Major Millions. Online Gambling News - Latest online casino bonuses, gambling promotions and casino news. Browse through the latest gambling news to keep yourself abreast of all the happenings and developments in the field of gambling. 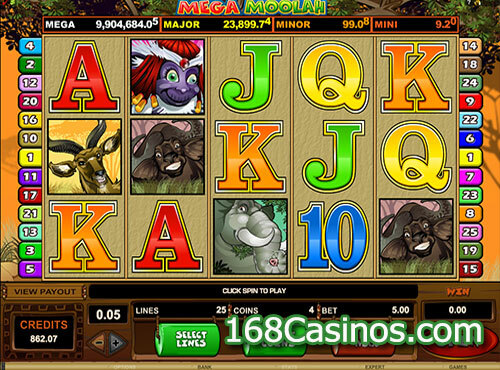 Copyright © 2006-2013 www.168casinos.com, All Rights Reserved.